Tropical Storm Erika in August 2015 was a very damaging and deadly tropical cyclone. The storm struck the Leeward Islands on August 27. More than USD$500 million in damage was caused by the storm. More than 30 people died when the storm passed through the Caribbean. 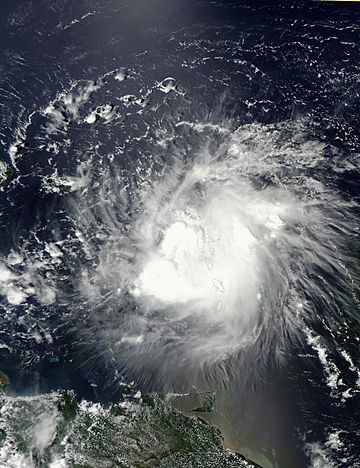 Resulting from Erika's impact over the northeast Caribbean, the name Erika was retired in April 2016. The name was replaced with Elsa for 2021. Erika became the second storm name that was retired. Allison was the first one. Official forecast positions (top left) and various forecast models for Erika versus its best track positions (black lines). Note the consistent northerly bias present in all outputs. The NHC's forecast track for Tropical Storm Erika at 5:00 a.m. EDT (09:00 UTC) on August 28, just before its dissipation as a tropical cyclone, depicting the storm traversing the Dominican Republic, brushing the Bahamas, and moving across the entirety of the Florida Peninsula. 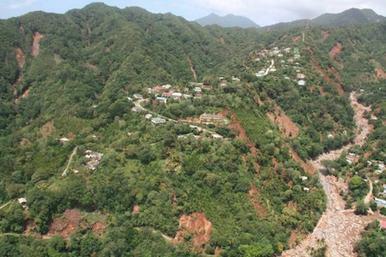 The rugged terrain of Dominica makes it prone to landslides in heavy rain events. The town of Petite Savanne (pictured), situated on steep cliffs, was rendered uninhabitable after numerous landslides devastated the area. Tropical Storm Erika Facts for Kids. Kiddle Encyclopedia.